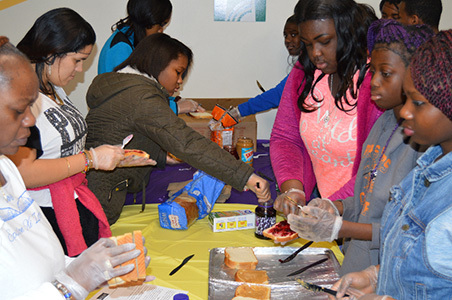 Young people and adults work together to provide sandwiches for the Trenton Rescue Mission. The volunteers included many MCCC staff members including, from left, Alicia Eskeitz, Rayshaun Jones and Bilquiz Zaka. 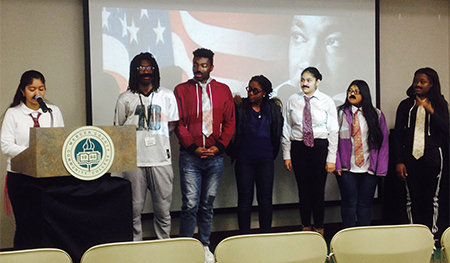 Youth College students, sporting Dr. Martin Luther King moustaches, reflect on their own dreams for MLK Day. Trenton, N.J. – The lights got turned on early in the Center City Café at Mercer County Community College's (MCCC's) James Kerney Campus in Trenton on Jan. 16. Starting at 8 a.m., more than 200 volunteers gathered for the college's Day of Service in honor of the Rev. Dr. Martin Luther King. 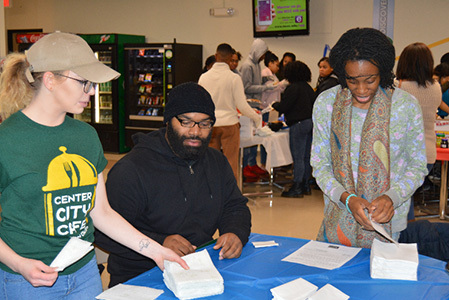 An assembly line of young people, MCCC staffers and community residents made peanut butter and jelly sandwiches for the Trenton Rescue Mission. By the time they were finished, they had made 1,323 sandwiches. Stacy Denton, director of MCCC's Upward Bound program, who helped organize the sandwich-making extravanganza, credited 10 organizations for their participation including students in Mercer's Youth College programs (VIP, Upward Bound and GEAR UP), Teen Voices - A 21st Century Program from Pennsylvania, House of Blessings Church, the Boys and Girls Club of Trenton, Zeta Phi Beta Sorority, Inc., and Phi Beta Sigma Fraternity, Inc. 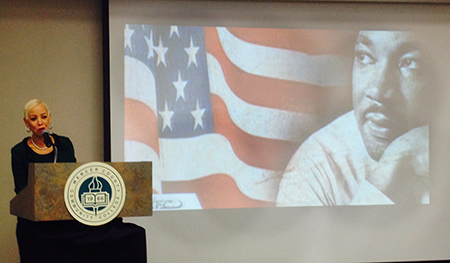 The observance continued with an afternoon ceremony in Kerney Hall that featured special guest Dr. Pamela Pruitt. Dr. Pruitt spoke about "The Power of Education: Then, Now and Tomorrow." She noted that Dr. King’s civil rights efforts were for the good of all people, not only black Americans. And, she reminded the audience of community members and students that knowledge is power. “It empowers us to keep moving forward,” she said. MCCC bursar Lucia Brown-Joseph also assisted in organizing MLK events at the college.